The Titoni Airmaster All you need to know about the exceptional yet affordable Swiss watch that has made a return to India after 40 years. After exiting India during the emergency, Swiss watchmaker Titoni marks its return to India this year after a 40-year gap with the launch of the gorgeous day-date automatic Airmaster. For over 97 years, Titoni has been crafting excellent timepieces at its headquarters in Grenchen, Switzerland. It was also one of the first Swiss watch brands to establish an active business in India. Titoni setup its subsidiary here soon after India gained independence and quickly became the most recognised Swiss watch of the era. A 100% independent, fully-owned Swiss watchmaker, Titoni has been active in the mid-range market segment and is perhaps among the few luxury watch brands with the motto, “You don’t need to be a billionaire to own a beautiful watch." Titoni’s Airmaster is a perfect amalgamation of classic lines and elegant design. Manufactured in Lucerne, the watch is hand-assembled from start to finish with over 100 dedicated craftsmen working on one watch at a time. What sets the watch apart is the dial - clean, uncluttered and classic. The applied diamond-cut Roman numerals against the sun-brushed black dial give it a striking appearance. The two-tone design makes it ideal for formal as well as casual occasions and adapts perfectly to the style of the wearer, befitting a man of any age. The Airmaster day-date is powered by an automatic Swiss Made mechanical movement (Sellita SW200-1 and Sellita SW 240 across different versions) with a fairly decent power reserve of 40 hours (ideal for daily wear), and has an accuracy of 28,800 Vph, i.e., it’s accurate to 1/8th of a second. The watch features hours, minutes and seconds functions with a day, date and day of week display. What’s more interesting to know is that each Titoni timepiece undergoes the most rigorous of tests before it gets to adorn a wrist. In terms of durability, the watch is made of 316L stainless steel and is well protected with scratch-resistant sapphire crystal and a water resistance up to 50m. The Airmaster collection has been priced carefully by the brand, starting from Rs. 80,000. Trust us when we say you will not get a better and more reliable automatic Swiss Made watch that boasts of such finesse and quality. 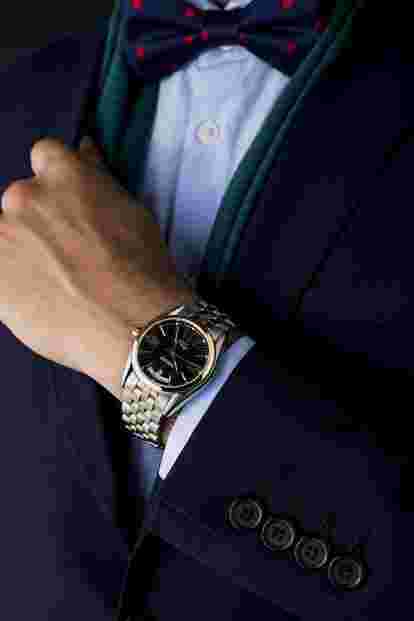 The watch can be worn as easily to the boardroom or a whiskey tasting as it can be to a regular day at work or a special occasion. Check out the complete Titoni Collection here.